"We are proud of the environment we have created for our staff and clients – it’s a bright and fresh space to work and an example to our clients of how sustainability can be addressed and recognised without high upfront costs." 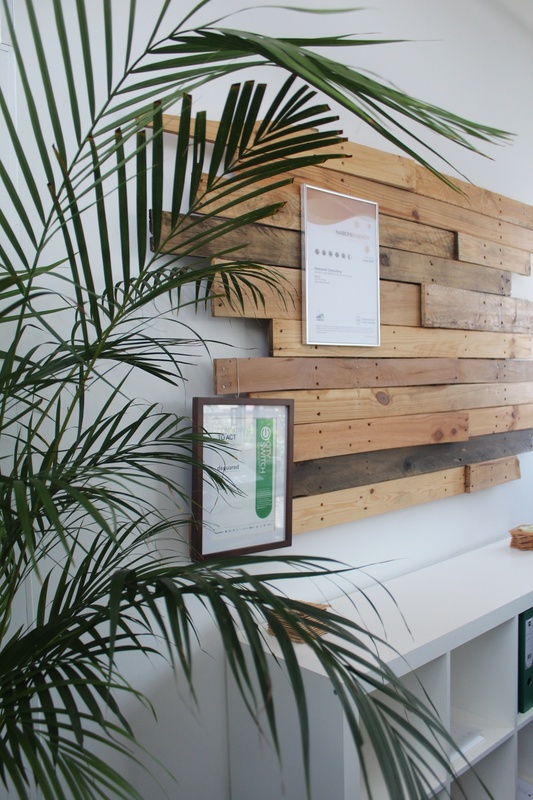 dsquared Consulting’s new office fitout achieved the second Green Star – Interiors rating in the country. The team has demonstrated how a strategic location, smart ideas and a simple approach can add up to a great sustainable workplace. dsquared chose its office for its central location which provides excellent access to public transport, amenities and other services within the Adelaide CBD. This clever consideration earned the project five points under the ‘Commuting Mass Transport’ credit – and that’s before any fitout costs have been incurred. As a CitySwitch signatory, dsquared diligently manages its energy consumption. The naturally daylit office and low-energy appliances have kept energy use minimal from the start, and the dsquared team has challenged itself reduce the use of heating and cooling. “Our efforts have paid off as we have now secured a 5.5 Star NABERS Energy rating and have achieved the SA award for City Switch Signatory of the Year as recognition of our achievement,” Deborah Davidson says. The project achieved 12 points in the ‘Greenhouse Gas Emissions’ credit for energy efficiency, exceeding the NABERS 4 Star benchmark by more than 60 per cent. In practice, the tenancy achieved a 5.5 Star NABERS Energy certified rating in June 2014. The compact fluorescent lighting is rarely needed during the day, and the landlord has installed motion and daylight sensors as part of the lease agreement. Carpets recognised by the Carpet Institute of Australia Limited Environmental Certification scheme were also installed by the landlord. Airconditioning is also unnecessary, with the balcony doors providing natural air flow through the space. During the coldest months of the year, manually controlled energy-efficient radiant panel heaters do the job. All four staff use laptops, instead of desktop computers, and a kill-switch by the front door turns off all power when the office is vacant. Old office partitions were demolished and recycled, and existing finishes were reused where appropriate. Green Star points were awarded for the plants added to both the interior and balconies, and for the office’s good access to daylight and views, and excellent natural ventilation. Pinboards, a central workstation bench and a cable organiser, designed by ESD Consultant Ken Long and crafted by a local woodworker, came from salvaged wooden pallets. Hanging planter pots were picked up off the street after neighbouring business tossed them out, while planter boxes and a worm farm have been constructed from discarded milk crates. These inspiring initiatives were rewarded with one point under the ‘Recovered Products and Materials’ credit.